It’s one of the interesting wines of Kayra’s Vintage series. Produced by the Sangiovese grapes coming from Manisa – Turgutlu’s Halilbeyli village. This 2007 vintage has some highlights of brown in color, an opaque red. On the nose it is quite intensive than I was expecting. Nice and smooth complexity. Mint, vanilla and toasty notes coming from the oak are followed by red berries, dried tomato, blueberry, some violet and earthy – spicy hints. On the palate not has got the acidity which we may expect from a typical sangiovese. However, there is an interesting smoothness and light body on the palate. Certainly there is more fruit especially in the mid-palate. Oaky notes are much more behind than the nose. There is some sweet structure during the medium length finish. It is a very light bodied wine, for the people who do not like tannins. Totally 2300 bottles were produced. Mine was no. 917. It is 47 TL in Rouge Wine Bar. 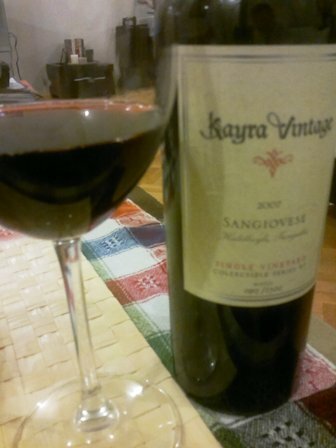 This entry was posted in Kayra wines, san giovese, Tasting notes. Bookmark the permalink.